“Follow Malia Lane's travels online at MaliasMiles.com. Look for her article, "Spooky Savannah," in MotorHome Magazine's October Halloween edition. “Blue Ridge Parkway is the most popular destination in America's National Park System. Call the park information line, (828) 298-0398, for up-to-date road closures and parkway weather reports. Web site: nps.gov/blri. “Biltmore Estates, on the outskirts of Asheville, N.C., is open year-round and is known for its elaborate seasonal activities; (800) 624-1575, Biltmore.com. “Chimney Rock Park, 25 miles southeast of Asheville, has great views and several easy-to-strenuous day-hike trails; (828) 625-9611, chimneyrockpark.com. “Grandfather Mountain, near Linville, N.C., is the highest peak in the Blue Ridge chain; (800) 468-7325, grandfather.com . 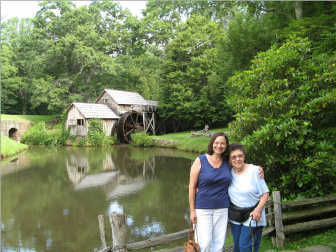 “Mabry Mill is a NPS historic site. The restored gristmill is a popular spot for photographers and artists; (276) 952-2947. Malia Lane usually travels solo in her 36-foot motor home. About once a year, however, her 80-year-old mother joins her for a long road trip. Together they have traced the Alaska Highway, explored the Oregon and California coasts, and stopped in to say hello to Mickey Mouse at Disney World in Orlando, Fla. This summer they followed the Blue Ridge Parkway from milepost 469 in the Smoky Mountain National Park in North Carolina to its beginning in Virginia’s Shenandoah National Park. “It’s raining like crazy here, lightening and thundering, everything,” Lane said during a mid-July cell phone conversation from a campground near Natural Bridge, Va., a few miles west of milepost 62 on the parkway. Lane, a full-time RVer since 2001, is researching an article for MotorHome Magazine about RVing the parkway in two seasons: summer and autumn. To help with “gas money,” she also works temporary paralegal jobs, which she will do in Charlottesville, Va., before jumping back on the parkway in October to head south, taking in the brilliant fall colors. Over the past six years, Lane has lived in almost every region of the country, including the Pacific Northwest, where she stopped for several months in both Washington and Oregon. Since leaving Oregon in 2005, she has had extended stays in New Mexico, Texas, California and South Carolina. Lane was working in Savannah, Ga., for three months before her mother, Bertha Quimby, flew in from Austin, Texas, for a rolling visit. They pulled out of Savannah on June 14, heading for the southern end of the Blue Ridge Parkway near Cherokee, N.C.
“Our goal was not to miss a foot of this beautiful drive,” says Lane. The popular winding, two-lane scenic roadway, with its breathtaking views, stretches along the front range of the Appalachian Mountains. An estimated 20 million visitors travel some portion of the route each year. Then there are the trees, more than 120 species. The Southern Appalachian region is said to be among the most biologically diverse areas in the world. “It has been a great, great experience,” Quimby says. When asked for her top three places, Lane hesitates. “There was so much,” she says of their four-week journey. “Biltmore Estate, a glorious, 8,000-acre parkland nestled in the mountains near Asheville. The estate’s centerpiece is America’s largest privately owned home: a 250-room French-Renaissance chateau completed in 1895 for George Vanderbilt. The house alone has four acres of floor space. This National Historic Landmark is among the country’s most visited historic residences. The estate includes lush gardens, scenic walking trails, a winery, a lake or two and an incredible four-star inn. “Chimney Rock Park, with some of North Carolina’s most sweeping vistas, is about 25 miles southeast of Asheville. Lane remembers hiking the sometimes strenuous, 1.5-mile Skyline-Cliff Trail Loop, which leads to the top of the 404-foot Hickory Nut Falls. “Grandfather Mountain in North Carolina is the highest peak in the Blue Ridge Mountain range, measuring in at 5,964 feet. People stop here to soak up the beautiful mountain scenery and to traverse the Mile High Swinging Bridge. The bridge itself is not really a mile high, unless one measures it from sea level. After Lane and her mom finished their monthlong excursion, Bertha Quimby boarded an airplane in Richmond for her return flight to the Texas hill country.